23 Jan. 2019 - The *glassmaster.cat catalog files had some columns missing and/or mis-matched, which have been fixed. 23 Feb. 2017 - Abell 2744 and MACS 0416 have Version 2.0 of the redshiftcatalog.txt files. 05 Oct. 2016 - Abell 370 and MACS 1423 have Version 2.0 of the redshiftcatalog.txt files. These include some updated redshifts for targets, and a few new targets. 04 Dec. 2015 - The *glassmaster.cat catalog files had some columns missing and/or mis-matched, which have been fixed. 30 Nov. 2015 - The initial redshift catalog for RXJ 1347 contained incorrect source coordinates, which has been fixed. 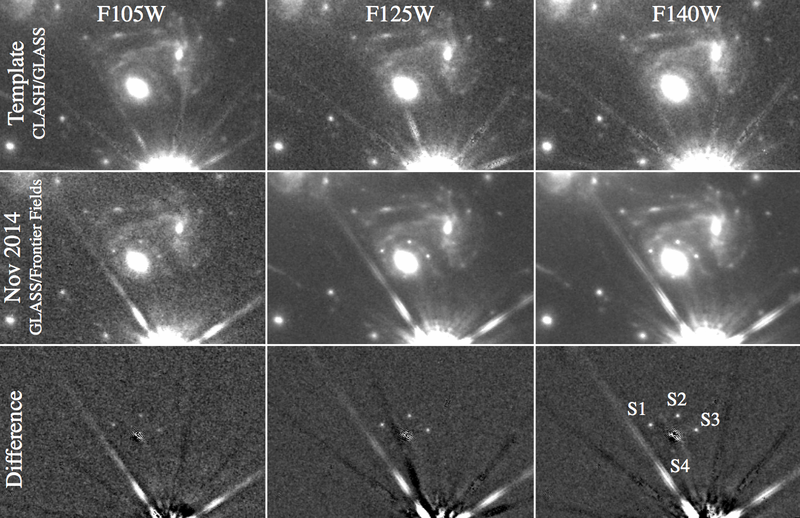 First multiply imaged, strongly lensed supernova . Improved mass reconstruction of Abell 2744. Gas-phase metallicity gradients of galaxies at z~2. 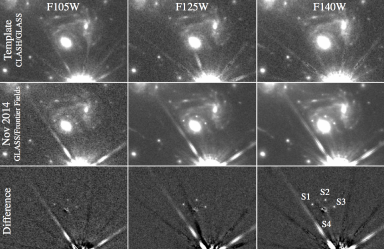 GLASS is a cycle-21 large program (Program 13459) with the Hubble Space Telescope, targeting 10 massive clusters, including the 6 Frontier Fields, using the WFC3 and ACS grisms. The program consists of 140 primary orbits (with the G102 and G141 grisms) and 140 parallel orbits (with the G800L grism). Using the clusters as cosmic telescopes, GLASS is taking spectra of faint background galaxies with unprecedented sensitivity and angular resolution. GLASS has three primary science drivers, although a variety of other science investigations are possible in combination with imaging campaigns like the Frontier Fields Initiative and CLASH. To shed light upon the role of galaxies in reionizing the universe, the topology of high redshift intergalactic/interstellar medium and on Lyman alpha escape fraction. 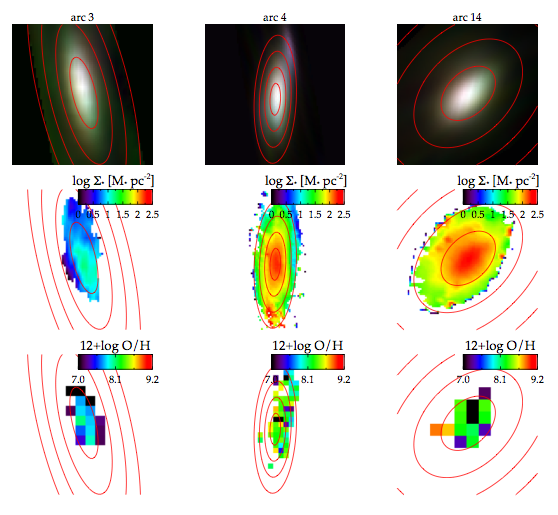 To study gas accretion, star formation and outflows by mapping spatially resolved star formation and metallicity gradients in galaxies at z = 1.3 - 2.3. To study the environmental dependence of galaxy evolution, by mapping spatially resolved star formation in galaxies in the cluster cores and infalling regions. For a complete description of the data products available for both the WFC3 NIR Release and the ACS Optical Parallel Release, visit the pages linked below. Click on "LOAD" to visit a page containing the extracted target table for the redshift catalog (#7 in the list of data products) of that cluster. Each extracted target has a "quick-look" summary plot, as well as links to download that target's data products, or visit that target's "Details" page that provides plot and links to all the data products for that target. Use the links below "LOAD" to download "full-field" files for that cluster: "drz" = Alignment reference image, "seg" = SExtractor segmentation map, "redshift" = redshift catalog, "source" = SExtractor source catalog, "SExt" = SExtractor parameter file, "GiG" = GiG output catalog. Two "tar.gz" files are also provided below the "LOAD" link: "m≤24" contains all data products for bright sources with MAGAUTO ≤ 24, while "M>24" contains all data products for faint sources with MAGAUTO > 24. If you prefer to browse and download files directly through your web broswer, click on the "BROWSE" link to access a cluster's data products. Note that only objects from the redshift catalog (#7 in the list of data products) have their own sub directories here. To obtain data for any object in the Source Catalog (#6 in the list of data products) please download the tarballs for the bright and/or faint objects (#9 and #10 in the list of data products). *The GLASS redshift catalog only includes sources within 0.1" of a source from the master (HST+VLT+KECK for MACS1149, CLASH-Hubble Frontier Fields for MACS0416) redshift catalog. These are the sources that appear in the page displayed via the "Load" link. †Look-up table containing the GLASS positions, GLASS IDs, master catalog positions, and master IDs for redshift sources. ‡Master redshift catalog containing sources from combined analysis of HST, VLT, and Keck observations (for MACS1149) or CLASH-Hubble Frontier Fields observations (for MACS0416). If you prefer to browse and download files directly through your web broswer, click on the "BROWSE" link to access a cluster's data products. Note that only objects from the redshift catalog (#7 in the list of data products) have their own sub directories here. To obtain data for any object in the Source Catalog (#6 in the list of data products) please download the tarballs for the objects (#9 in the data products).